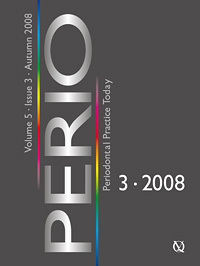 At present the field of prosthetics focuses on reducing periodontal and alveolar defects related to missing teeth, as well as using suitable restorative techniques and materials to ensure supplements are as biocompatible and functional as possible. Zirconium oxide is a relatively new material, and the evidence suggests that it could be an ideal restorative supplement for reconstructed periodontal and mucosal tissues. This case study of a patient with periodontal deficiencies provides some insight into the coordination of soft tissue management, including the shaping of zirconium oxide, and use of this exceptional material as a supplement, through to an optimised 'gum-tooth' perio-restorative interface. Aim: The aim of this report was to present the periodontal treatment and maintenance over a period of 12 years in two siblings with Papillon-Lefèvre syndrome (PLS), aged 17 and 15 years respectively. Study design: Initial treatment included oral hygiene instructions, a 0.12% chlorhexidine digluconate mouthrinse and scaling and root planing with simultaneous administration of oral 250 mg tetracycline twice daily for 2 weeks. For the first 4 years, patients were enrolled in a 1-month recall maintenance programme. Due to re-establishment of inflammation, during the next 8 years combined mechanical and antimicrobial periodontal therapy was administered. Clinical and radiographic evaluation was performed in 1993, 1996, 2000 and 2004. Results: In the first period, periodontal disease activity was controlled. In the second period, periodontal breakdown advanced rapidly, especially in the younger sibling. Tooth loss was inevitable, and both patients became edentulous at the age of 29 and 27 respectively. Conclusions: The role of oral hygiene in PLS may determine the rate of disease advance on an individual basis. As evidenced in the present cases, the adoption of a strict maintenance schedule and a high level of oral hygiene efficacy is a prerequisite for prolonging the life of the dentition. Microbiological tests have become a useful device in periodontal diagnostics. Knowledge of the grouping and quantity of specific bacteria in subgingival biofilms helps clinicians to expand their image of periodontal diseases beyond clinical findings and to evaluate treatment outcomes. Even if several microbiological diagnostic tests are available, there is little information on the advantages and disadvantages of specific test kits. The present research report deals with the comparison of the results of two different microbiological test kits. Tipton, David A. / Pond, David M.
Background: Aggressive periodontitis (AgP) causes rapid periodontal destruction. Matrix metalloproteinase- 3 (MMP-3) degrades the extracellular matrix and is associated with periodontitis. Interleukin-1ß (IL-1ß) upregulates MMP-3 in human gingival fibroblasts, activating genes via transcription factors (i.e. nuclear factor ΚB [NF-ΚB]). Cytoplasmic NF-ΚB is bound to inhibitors of KB (IKB), which are phosphorylated and degraded after cellular stimulation by IL-1ß, allowing nuclear translocation of NF-ΚB subunits (e.g. p65). This involves activation of IΚB kinase (IKK), requiring a regulatory subunit [NF-ΚB essential modifier (NEMO)]. The objective of this study was to investigate NF-ΚB involvement in IL- 1ß upregulation of MMP-3 in AgP gingival fibroblasts by inhibiting NF-ΚB activation with NEMO binding domain (NBD) peptide, blocking NEMO-IKK binding. Study design: Constitutive and IL-1ß-stimulated MMP-3 was measured by enzyme-linked immunosorbent assay (ELISA). For effects on NF-ΚB activation, cells were preincubated with 50 to 200µM NBD or control peptide (CP) for 6 to 48h, stimulated with IL-1ß, and nuclear p65 levels were measured. For effects on MMP-3, cells were preincubated with 50µM NBD or CP for 24 or 48h, stimulated with IL-1ß, and MMP-3 was measured. Results: There were time-dependent increases in constitutive MMP-3 production, and IL-1ß significantly increased MMP-3 at each time point. NBD peptide specifically decreased IL-1ß-stimulated nuclear p65 by approximately 55%, and decreased IL-1ß-stimulated MMP-3 production by a maximum of 26%. Conclusions: IL-1ß stimulation of MMP-3 may be partially regulated by NF-ΚB. Blocking MMP-3 gene expression by inhibitors such as NBD peptide may be an important approach for treatment of AgP. Objectives: The aim of the present study was to test the hypothesis that use of oral hormonal contraceptives causes changes in the oral microbiota during the menstrual cycle. Study design: Bacterial samples were collected weekly during a full menstrual cycle. Forty systemically and periodontally healthy women of childbearing age with a Community Periodontal Index of Treatment Needs (CPITN) score <= 1 using (n=20) or not using hormonal contraceptives (n=20) were studied. Seventy-three different species were analysed by checkerboard DNA-DNA hybridisation assay. Results: Most prevalent in non-contraceptive users at the time of menstruation were Fusobacterium periodonticum, Fusobacterium nucleatum nucleatum, Leptotrichia buccalis and Gardnerella vaginalis. No differences in bacterial levels as an effect of age or an effect of menstrual cycle in noncontraceptive and contraceptive users were found. Trends of higher counts of only G. vaginalis were found at the time of menstruation in non-contraceptive users (P<0.02) compared with 3-week samples. No differences were found in comparison to other time points. At menstruation, 15.9% of the sites in women in the group not using oral hormonal contraceptives were positive (>=1.0 x 105 cells) for Prevotella intermedia, which changed to 16.1% at day 21 following the onset of menstruation. The corresponding values for P. intermedia in the group using oral hormonal contraceptives were 14.6% and 17.9% respectively. Conclusions: No changes in subgingival bacteria as an effect of the use of hormonal contraceptives could be found. A high proportion of the women were identified with bacteria not commonly studied in subgingival samples. These results may not be similar in subjects who are not periodontally healthy.